Why is it that when you get the feeling you shouldn’t do something, you do it anyway? I’m talking about your “gut feeling”, no pun intended. We both knew right after we ordered the strawberry smoothie that it was a bad idea. So why then, could we not have just paid for it and politely left the fruit stand? We’re not sure. But, we’re guilty of ignoring our better judgement. We’ve been in Puno now for about 24 hours, only we’ve not seen much of it. Last night we arrived in the dark, with pouring rain and went up to the room, which although was near the plaza, my stomach was not feeling stable enough to go out. We were both starving, and we ended up having (and risking) a powerbar dinner. Pepto-bismol is my travel friend, and since we both ate the suspect strawberry smoothie, we both popped a chaulky pink pill in hopes of shortening the ill effects. This morning, however, we both woke up nauseated and queezy, and it was a stretch to force ourselves down to the lobby for a bite to eat. This was after we cancelled our 2 day 1 night trip to the islands with no water, toilets, or electricity, after travelling for 3 hours by boat. We could not justify this risk for many reasons. For breakfast, we managed a small piece of toast, a tiny bowl of cornflakes and a tea, which sat well enough in our stomachs for a short while. The guy from the tour company actually called us to make sure we didn’t need a doctor, and suggested we drink some Muna or Coca tea (which we did, all day) to feel better. 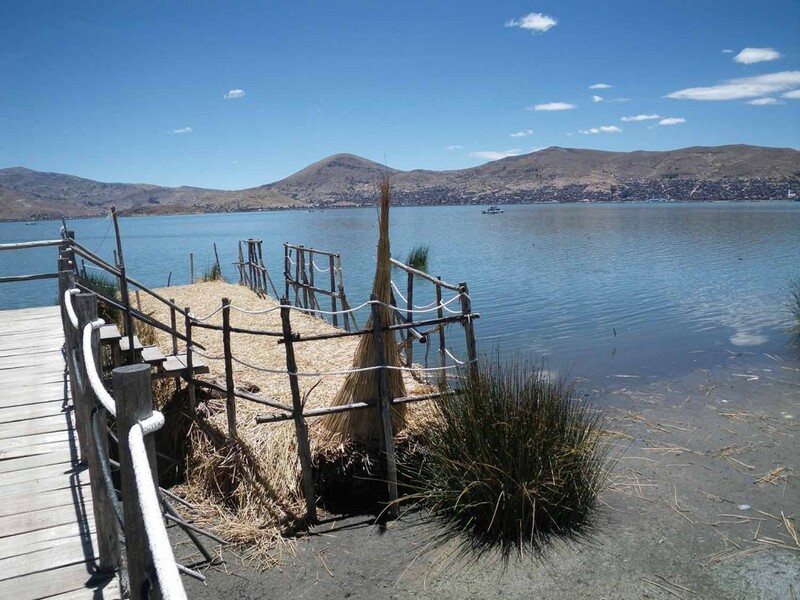 Our next decision was a hotel transfer to the lake, with a beautiful view from the room, nice garden’s around the property, and my favorite, its own never-ending pier with sheep, pigs, and llama’s grazing nearby. We alternated napping, planning our next few days, wandering down the pier, then had some chicken soup from the restaurant overlooking the lake. It was a day of rest, and hydration, and we’re booked for another different tour tomorrow. Here’s hoping the gastro has passed. On another note, I have to comment on the weather back home. Apparently, yesterday Calgary was the 2nd coldest place on the planet (only after the Antarctic). Now, I have to say this is VERY wrong, for it to be in the-30’s in November. I think you already know what we’re thinking….